NERF Basketball is an America institution. Bedrooms, dorm rooms and offices across the country are adorned with the tiny hoops — over doors and garbage cans, even occasionally mounted on a wall. But, the open-cell foam rock is undeniably 20th century. In this age, for better or worse, analog just isn’t going to cut it anymore. So, Hasbro went back to that incredibly reliable well it used to modernize Lazer Tag last year, and whipped up an iOS app that talks to a digital playset. 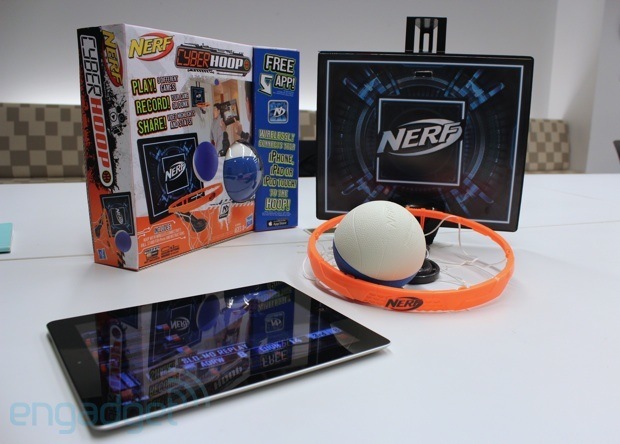 The NERF Cyberhoop is a re-imagining of the classic game with some serious electronic chops. Most prominently the ability to “connect” to an iOS device wirelessly using inaudible tones. Hasbro was nice enough to bring the set by our office for a quick sneak peek ahead of next week’s Toy Fair and after the break you’ll find our full impressions. Looking to save some coin on your tech purchases? Of course you are! In this round-up, we’ll run down a list of the freshest frugal buys, hand-picked with the help of the folks at Slickdeals. You’ll want to act fast, though, as many of these offerings won’t stick around long. If the mid-week blues are too much for you to bear, shelling out a few bones on a new gadget or two may just liven up those spirits. A 60-inch Panasonic Viera 3D HD display tops the list — if you weren’t enticed to jump at Monday’s offer — and a 8.9-inch Kindle Fire HD makes the cut as well. Head past the break for the full list, but don’t delay or these discounted links could be gone for good. Vote for the 2012 Engadget Awards! We’ve tallied your Engadget Awards nominations, and now it’s time to vote! Below the break, you’ll find our polls, which include the top reader submissions across 15 categories. Vote in as many polls as you like, but remember: just one pick per category. You have until 11:59PM ET on Monday, February 18th to cast your vote. As you may remember from last year, we’ll be posting readers’ choice selections — along with our editors’ choice picks — once all the ballots are in. Head past the break to get started! This entry was posted on February 6, 2013, 5:32 pm and is filed under Mobility. You can follow any responses to this entry through RSS 2.0. Both comments and pings are currently closed.